Oh friends! I am excited about the girl moms prayer calendars for the next couple of months! (Okay, who am I kidding … I’m excited about the calendars every month.) Do you get yours? If not, now is a great time to subscribe! Every month I create a Scripture-based prayer calendar for moms to pray for their daughters. We pray Monday through Friday (and use the weekends to catch up or pray the prayers for others). I’ve been creating these resources since 2015 which is just unbelievable to me. But here’s the deal, maybe you aren’t a girl mom. You can still use these prayer calendars to pray for yourself or for girls in your life. In fact, I’ve heard from many moms they are praying these prayers for their sons as well. That’s what I love most about praying Scripture — it’s all good for all of us. And there is so much we miss sometimes if we don’t slow down to read and ponder what God is revealing about Himself through the Bible. Praying through whole sections or books is one of my favorite ways to dig into the deeper parts of the Word. In January we used Deuteronomy 4 through 6 as a guide for our prayers. In February and March, we’ll be praying through one of my favorite Old Testament books — Isaiah. I love that we’ll be digging into this trove of prophecy and wisdom as we move toward Easter. It’s going to be such a rich time of prayer and study. If you’ve already subscribed, your prayer calendar info will arrive in your inbox today. If you haven’t, now is definitely the time to do so. And it’s super easy!! Simply fill out the form below and then confirm your subscription via email. 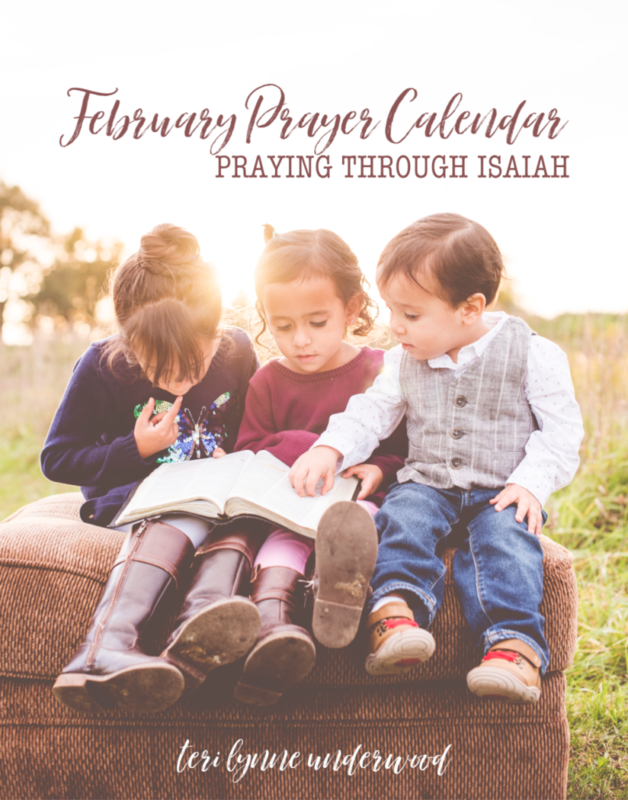 After that you’ll have full access to the prayer calendars as well as being the first to know about all the other resources I have coming for mothers of daughters. Every time I send out the prayer calendars, I’m amazed at how many moms are praying God’s Word every day for their daughters … it’s such an awesome thing to think that thousands of us from around the world are praying together. Imagine what God will do with that!! P.S. I also wrote a book on this topic — Praying for Girls: Asking God for the Things They Need Most. In it, I cover five key areas where we need to pray for our daughters. It’s a great resource to have and full of encouragement for you as a mom too! Learn more and order your copy here.